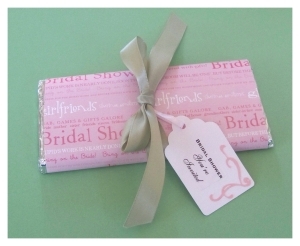 To make bridal shower invitation candy bars is an easy project and will leave a lasting impression on your guests. Keep costs down by ordering candy bars in bulk. Got no budget worries? Leave a lasting impression and a smile on the face of your guests by using high quality luscious chocolate bars. 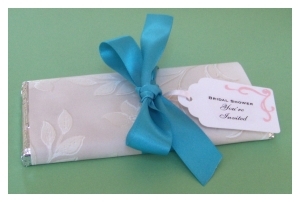 To make bridal shower invitation candy bars you will need to use a candy bar that has both an inner and outer wrapper. For example, some Hersey bars have a dark brown/black wrapper on the outside whith all of teh wording on it and so forth, and underneath this wrapper is a tinfoil wrapper. I actually used Cadbury candy bars for my invitations. First remove the outer label from the candy bar. Remove it carefully as to not damage the tin wrapping underneath. 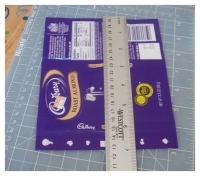 Use a ruler to measure the length and width of the wrapper. Make sure the measurements you take are long enough that the label will fit to wrap around the candy bar and overlap to hold together with adhesive. Choose a decorative paper to make your new bridal shower invitation wrappers out of. I recommend using papers found in the scrapbooking and paper crafts aisle of your local arts and crafts stores. They are perfect as they come in many different colors and themes. You may even be able to find a bridal shower themed paper. Cut your decorative paper to the same measurements that you took from the original candy bar label. I cut mine by hand using a sliding blade paper cutter. A super easy way to take care of this step would be to take the paper to a local copy or print shop where they have paper cutting services. All of your paper will be cut to size in minutes and for an incredibly affordable price. You can either print the invitation wording to the underside of the label or print onto another sheet and insert it between the label and wrapping. To print straight onto the label open a document in Word or a similar program. Change the document settings so that the page size maches that of your label. Type out the wording for your invitations and your labels are ready to be affixed to the candy bars. Wrap the label around the back of the candy bar and hold it in place by applying a strip of glue with a permanent adhesive glue runner. A glue runner will make this job incredibly fast and mess free. To top it off simply tie a big pretty ribbon around the candy bar and end it with a bow or decorative knot. I added a little decorative tag with the words "bridal shower" printed onto them. This is especially helpful if you have made the candy bar invitations with a paper that does not have a bridal shower theme. It lets your guests know that this is indeed a snazzy invitation rather than just a really pretty snack. You can make these tags either by using tags that you purchase already made in the store, and then punching the words "bridal shower" onto them. I actually went all the way and made the tags myself. To make the tags you will need to use either a tag shaped paper punch, or die cut machine with a tag die. Me? I used the cricut expression die cutting machine to create my tags. I printed the words onto some white paper, and then had the machine cut the tag around my wording. I then created some nifty paper flourishes (also from the die cut but can also be made with a paper punch or even a rubber stamp)and attached them to the tag with some craft glue. I tied the tag on with some thin ribbon in a matching color. Any regular old string will do the trick really.